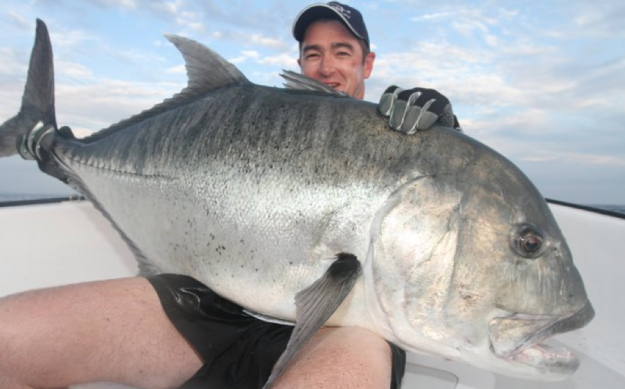 Huge GT Popping New Caledonia Sport and Light Tackle Adventures! 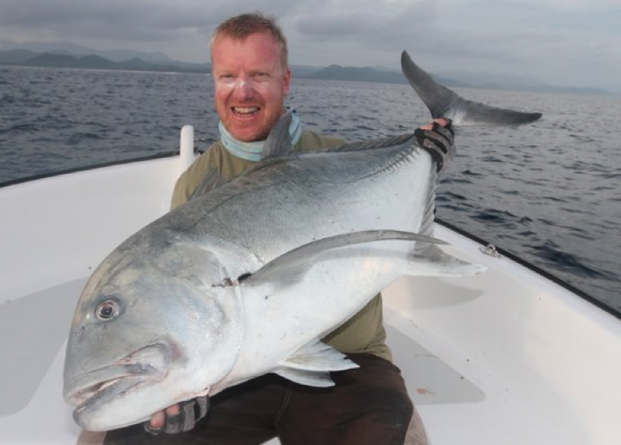 I have just returned from an unforgettable experience fishing for GT’s in New Caledonia, I was really not sure what to expect on this trip but it delivered the goods on all fronts. Firstly David and our Ocean Blue head office team did a great job of putting it all together, especially with a last minute time frame. The team in New Cal consists of guides Étienne and Manu, who are world class guides and passionate about their fishery, I just can’t say enough good things about these two hard working guys! 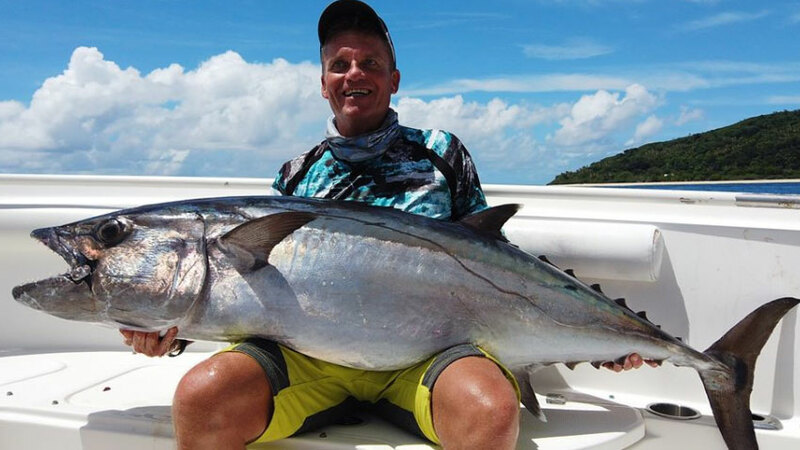 New Caledonia is a special place, it has a giant lagoon that surrounds a fair majority of the country and this gives the angler an all-weather option. The wildlife is stunning with countless turtles, plenty of dugongs and an array of seabirds all calling this place home. But the stars of the show are all the fish, we caught an quite a number of different species including, GT’s (of course), Red Bass, giant Coral Trout, Bluefin Trevally, Spanish Mackerel, Wahoo, Long Tom, Blue cod, Barracuda and we also stuck the hooks into some Sharks, Yellowfin and another incredible species I will elaborate on later.. All of these fish were hooked on surface lures with both poppers and stickbaits doing the damage. 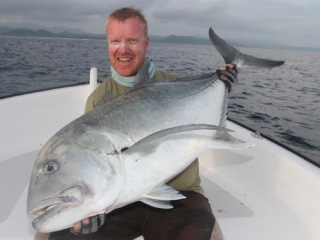 You will also get to see plenty of sea turtles and dugongs as well while you are out at sea. 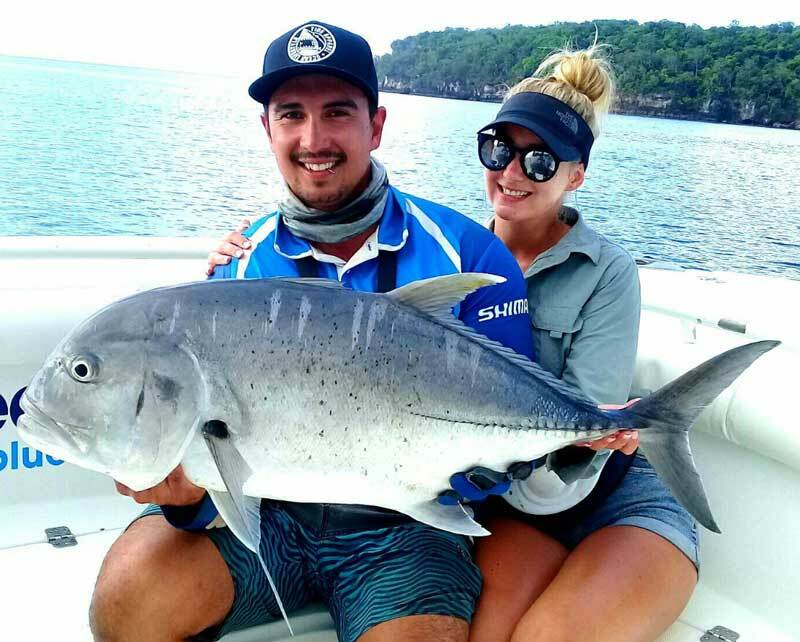 Day 1 and 2 were the pretty quiet compared to the rest of the trip but we still managed to get into some nice fish, a couple of GT’s over 30 Kg were landed and some bigger ones hooked and lost including a real ripper inside the lagoon which stripped some real line off before earning it’s freedom in the coral. These two days were spent at the Ouanu surf camp which has a neat little bar and the hosts looked after us with huge meals and some nice local beers. The evening of Day 2 we moved up to the Nekweta surf camp and met Manu and Stephanie for the first time, upon arrival Stephanie whipped us up a delicious batch of fresh Wahoo and it is a fish that earns its reputation for its eating qualities. Battling away with some dehydration problems, day 3 went ahead and our new destination was proving to be a little bit more productive. 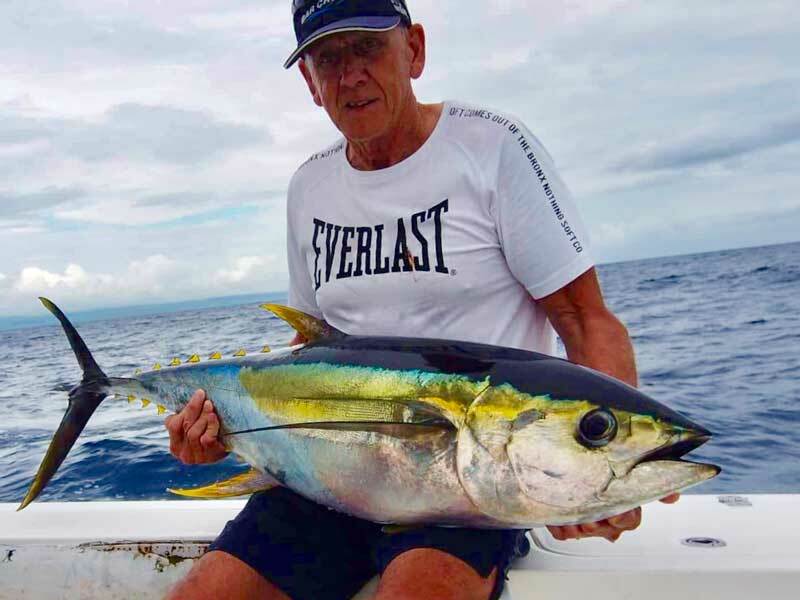 A few good fish were landed but nothing to write home about, during the afternoon Etienne unleashed the secret weapon, a sinking Orion Big Numbas and from this point on, this lure become a legend. I had attack after attack from big GT’s but I couldn’t get one to stick and was soon getting a hard time about my rubber hooks! I had some stomach issues to contend with, that combined with too much sun and not enough water saw me go downhill fast and later in the afternoon I was not in a good way. 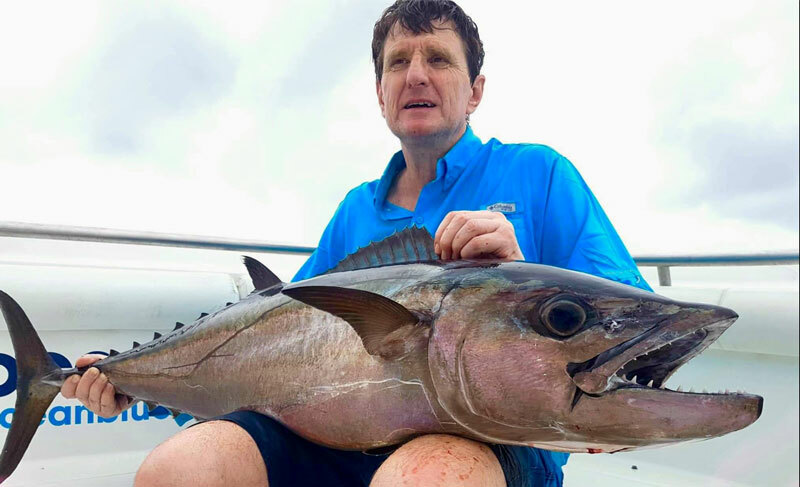 We did come across a patch of yellowfin tuna and hooked into a few of these but they were soon torn apart from hungry sharks, one attack was brutal with 3 big sharks fighting over the carcass on the surface not far from the boat. 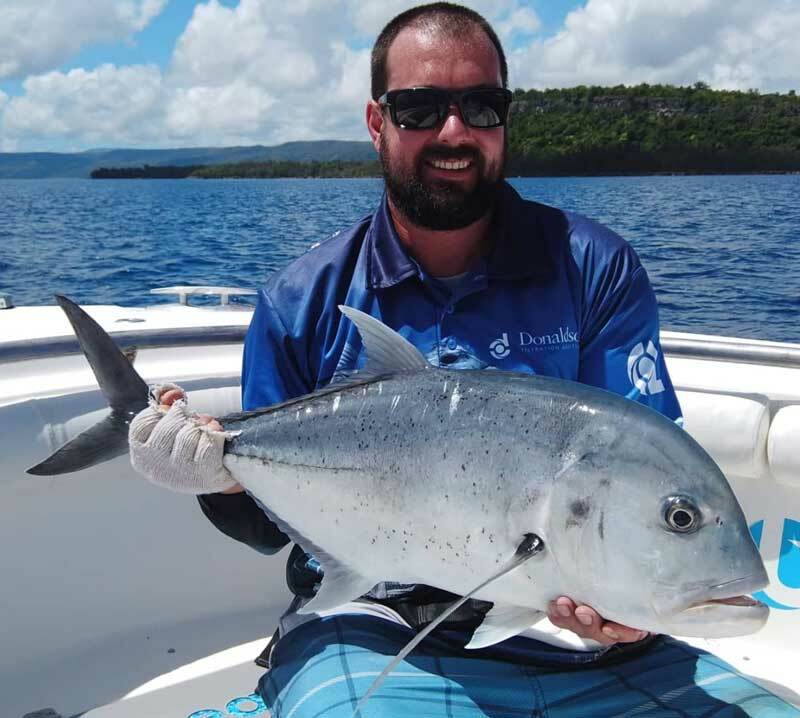 Thankfully on day 4 I awoke feeling really good and ready to take on some of the big fish New Caledonia is famous for, this was the day things started to heat up for yours truly. 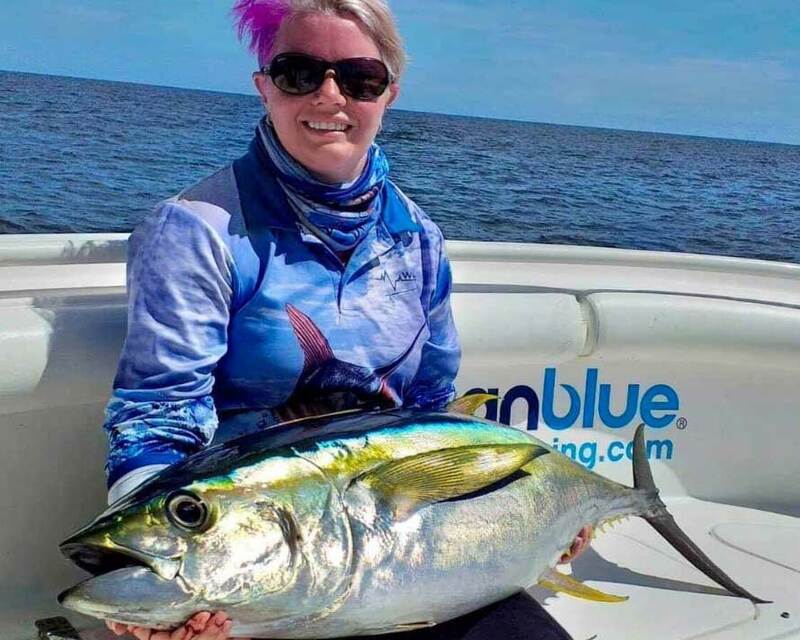 I don’t know if the bite was better or it may have been that all of us had changed to Orion lures but we were greeted with a steady flow of fish throughout the day. 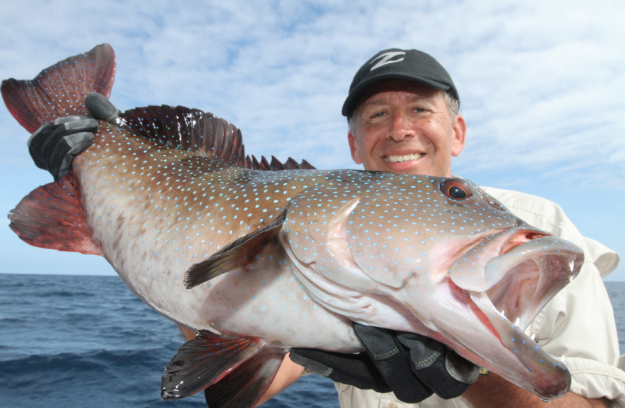 Nothing huge for the day but some quality fish including coral trout to 18kg were caught. Day 4 was also the day that a fish came in and hit the lure right in front of me and I have to say it was a sight I will never forget. The fish was a giant sailfish that shot up out of nowhere and grabbed hold of the Orion stick bait, it then didn’t move for about 30 seconds…but just sat in front of us shaking its head from side to side. After this it shot off in a blistering run and unfortunately the hooks fell out. Wow! 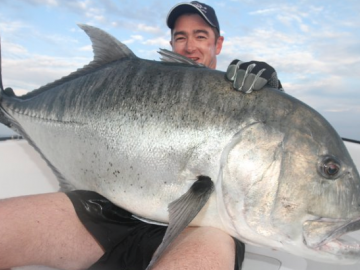 Day 5 was the day of giants, we hooked plenty of them but landing them proved to be difficult, of course there were some pretty big bust off’s & on really big fish. Towards the end of the day Etienne and Manu took us to a nice point with plenty of current and loads of bait. With darkness approaching time was running out for me to get my big GT. A GT appeared with a big swirl enclosing around the lure, followed immediately with line ripping under heavy drag from my reel. This was going to be my last chance so I was very nervous to say the least, the Carpenter Monster Hunter rod was too much for the fish and soon after it was boat side a nice GT in the mid 30kg range. With that I was happy and hung my rod up for the trip, I handed over the big Numbas to Steve for the last 5 casts of the day and on his very last cast another big swirl behind his lure and with some good technique he was locked and loaded onto a good fish. This beast proved to be a real fighter and it took some time to drag it out into deep water and even then it still battled hard. When in the boat this fish ended up being the fish of the trip in the mid 40 kg range. 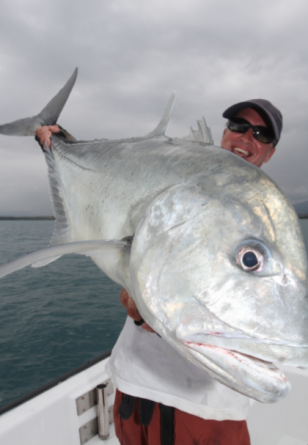 For those of you interested in heading to New Caledonia then I suggest you give Ocean Blue a call and try to get on with Étienne, he is a genuine top bloke and a great guide. 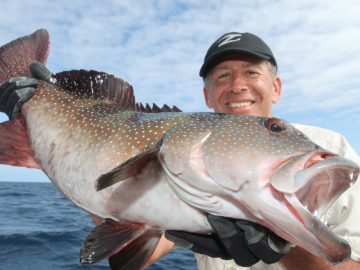 If you do head up take a range of big poppers and stick baits, get Orion’s if you can they were lethal. 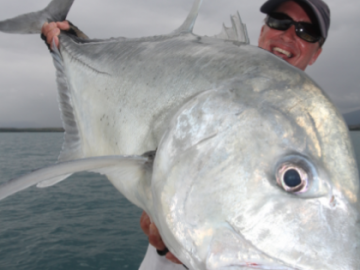 Take a powerful rod and reel; these things are unforgiving even on heavy gear. Don’t expect any of them to come easy, some bites are few and far between and you need to make the most of every one. Practice striking the fish! This was my downfall and I intend to work on this before I head back. You really do need to ram the hooks home to make sure of a good hook up.